Lying amid piles of bright white paperwork covering Michael Vinick's desk are a couple of stapled sheets that are profoundly yellowed by time. "That's my 1991 tax return," noted Vinick, president of Duct & Vent Cleaning of America (DVCA) in Springfield, with a broad smile. "I keep that right here...to remind me." What's being recalled is the amount of income reported on the revenue line: zero. Over the course of the past 20 years and those very humble beginnings, Vinick, who left a coveted position in the late '80s as a stockbroker, much to his father's chagrin, has grown his business from being one of the first duct-and vent-cleaning companies in New England (and the nation, for that matter) to a sector leader that recently completed what became a two-month assignment to clean the 5.68 miles of duct work on the U.S. Navy's medical ship Comfort. 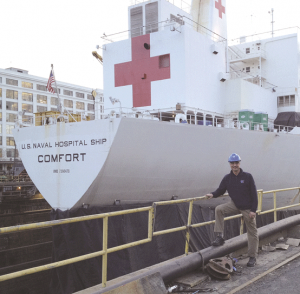 The Comfort, Vinick explained, is the navy's largest mobile medical treatment facility, essentially a floating hospital that requires a superior air-flow system, like any hospital on land, to be fully operational without risk of poor air quality to patients and Navy personnel. The Comfort is 894 feet long, 106 feet wide, and weighs 69,360 tons. It has sailed to countless ports to care for the wounded during wartime and natural disasters; its service record includes work following 9/11 (it was deployed to New York for several weeks), the destructive earthquake in Haiti, hurricanes Katrina and Rita, Operations Desert Shield and Desert Storm, and many others. The heart of the ship is her 12 operating rooms and 1,000 beds that support the many different required levels of care. The Comfort can receive and care for 200 patients per day and can sustain up to 2,000 people onboard. Cleaning her duct work is easily the biggest job DVCA has taken on, said Vinick, and one he expects to be a catalyst for others like it. "The scale and complexity of this project was vast, but certainly not improbable for our service team to complete, and we did more than five miles of it in 55 days," Vinick said. "It's a definite springboard to a new level of our business." Calls are already coming in from other shipping corporations as word spreads of DVCA's work on the complex job. But the company had already earned a solid reputation within the industry, said Vinick, adding that it was earned the hard way - through years of convincing both homeowners and commercial property owners of the importance of air quality to not only overall health and well-being, but also bottom-line productivity - and then providing quality work. For this issue and its focus on the building trades, BusinessWest takes a closer look at Vinick's growing company, as well as a service that has fought image problems - duct work is conducted out of sight, and some unethical operators have created a disreputable characterization - but is now recognized as vital amid growing concerns about 'sick' buildings. 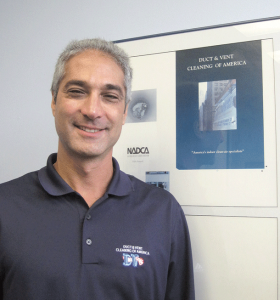 DVCA got its start in 1989, when Vinick's cousin, Ron Eckman, who also owned a carpet-cleaning business, recognized that duct and vent cleaning might be an important emerging market. Vinick and his father, Jim Vinick, a well-known local finance expert, can laugh now about how the son left an investment house and the potential for a bright future in the financial-services realm to clean ducts and vents, but no one was laughing then. "Im sure my father was thinking, 'what? Are you nuts? laughed Vinick. Within the first year, Eckman turned over control of the company to Vinick, and there were many nights of sleep lost wondering how he was going to make payroll and hoping the guys were going to show up for work the next day, and that the next job would come through. For more than two decades, the Springfield-based company grew and evolved, establishing satellite field offices in Connecticut, Rhode Island, and Maryland, which Vinick said were opened due to quality work, a growing number of referrals, and expanding relationships. Due to those budding relationships, DVCA's portfolio has come to include the Pentagon, the Empire State Building, Canyon Ranch, Yale University, facilities owned by General Electric and Hasbro, the U.S Coast Guard ship Eagle, and the aforementioned Comfort. But amid these high-profile jobs - and the reason they came about - has been what Vinick calls the "real story" of having to convince homeowners as well as commercial property owners and managers that air quality is a vital part of human health, productivity, and energy efficiency. "Back then, I'd approach mechanical contractors, trying to convince them that our services were warranted and needed, and they'd say, 'we don't need your services; this is ridiculous, it's 'hocus pocus,'" said Vinick. Ultimately, the commercial world slowly started seeing the difference in air-flow quality, which has now led to duct and vent cleaning being part of the overall specifications for most renovation or construction projects. Vinick points even to new construction, which calls for a final cleaning in brand-new duct work because of the construction debris that collects before the final nail is in. "People spend 99% of our time indoors, and yet we don't care about the quality of the air that we breathe," said Vinick. "Think about it; you're in your car, your house, your office... how often are you really outside?" Homes with dogs and cats, or residents with allergies, need to have their homes cleaned more often, said Vinick. But even newer homes aren't up to speed in the new- technology category because the filters are still low-grade unless the homeowner knows enough to ask for an upgrade. Regardless, the ducts need to be cleaned and the filters need to be changed, or the debris buildup causes a growing blockage, which causes suffocation, severely reducing airflow. "And the motor on the unit is working harder, the boiler is working harder, and you just blew your energy consumption right through the roof," said Vinick, adding that 20% of the buildings in this country are considered 'sick,' meaning air quality is not what it should be. "That's the EPA [Environmental Protection Agency] talking, and that was 20 years ago, so I guarantee it's more now." Vinick used some simple math to get his points across. "You lose one dollar of productivity per square foot in a sick building," he said. "Now, say you have a 300,000-square-foot office building - you're losing $300,000 a year in productivity." Employee sick days and slow-paced work due to fatigue can result from faulty or dirty air-flow systems that recirculate dust, building chemicals, and microscopic particles (airborne sickness) that infect workers. "Years ago, the EPA said that indoor pollution is one of the top four threats facing the country, but have you heard anything about that?" he asked rhetorically, adding quickly that most people have not. While it's not household knowledge, over time the realization that duct and vent cleaning was a viable service created that growth market that Eckman and Vinich predicted. And this growing competion has created both challenges and opportunities. The growing number of players in the field - and the corresponding need to generate business for them - has certainly helped raise awareness of the problem of 'sick' properties. "We were the first in the Northeast, but others were getting involved in the business, educating the consumer, which was helpful so we weren't bearing the burden with education." Meanwhile, some less-than-scrupulous operators created image problems, but also growth opportunities for companies, like DVCA, that focused on quality work and customer satisfaction. Indeed, the other part of the education process, Vinick explained to BusinessWest, is that direct-mail or Internet specials promising to clean a homes ductwork for $49 is not only impossible, but almost always leads to problems that raise the price way over what should be a typical $400 job. Today, much of the education about unscrupulous companies and indoor air quality is provided by a national trade association, the HVAC Inspection, Maintenance and Restoration Assoc., also known as the National Air Duct Cleaners Assoc. (NADCA), on which Vinick has a board seat. NADCA, which started with only 12 members, including DVCA, grew as DVCA grew, and promotes source removal as the only acceptable method of cleaning. Being one of the first companies of his kind in the Northeast, Vinick said, DVCA wasn't immediately accepted by NADCA because it used portable vacuums, not just truck-mounted units, which allowed his technicians to sometimes get up inside ductwork with their HEPA (high-efficiency particulate arrestance) vacuums, which made DVCA unique. Michael Vinick says people spend the vast majority of their time indoors, yet rarely think about the quality of the air they breathe. But Vinick prevailed, and the mobile-cleaning process is now a common part of the industry, and the NADCA today has more than 1,000 members. The association has since established industry standards and expanded its mission to offer training, education, and certification, which Vinick said takes years to gain. "We have to have field, industry, and technical knowledge; OSHA safety knowledge; HVAC knowledge; duct-design knowledge; humidification, dehumidification, fungal-growth, and microbial-issues knowledge, Vinick noted, adding that the exam is tough; he compared the final process in some ways to becoming "an indoor weatherman." It's this deep history in the growth and acceptance of the industry, in addition to building important relationships, that gained DVCA a solid reputation, one that caught the attention of the U.S. Navy, said Vinick. "We got a call last fall from a ship-restoration firm who said that they would like to deal with a local company [near Boston], and they knew our reputation," said Vinick, adding that DVCA was eventually awarded the contract. "It's an incredible ship," he said. "It's awe-inspiring when you walk in because it's a hospital." 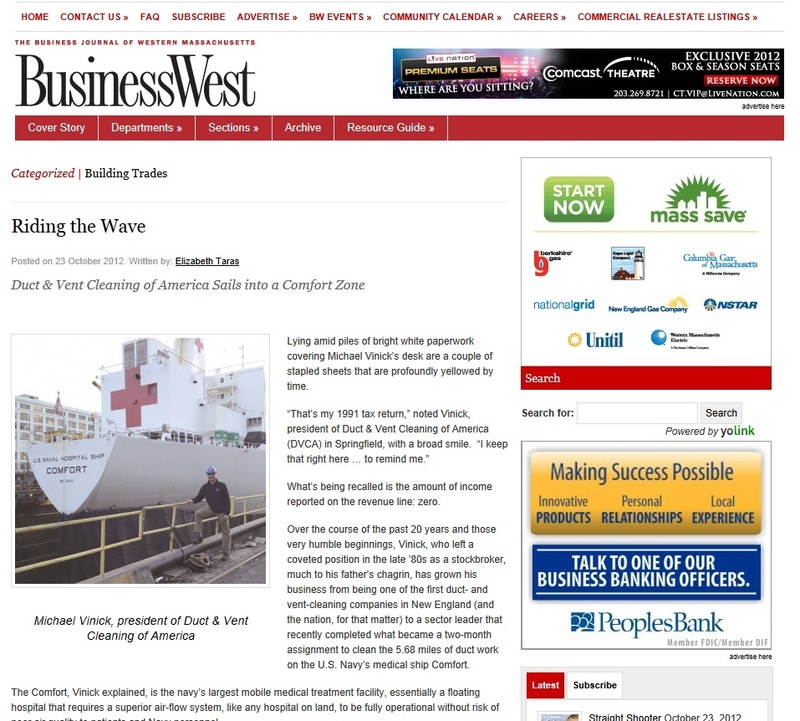 At nearly three football fields in length, Vinick told BusinessWest, what impressed him most about the Comfort was the elaborate ramp system where the wounded are brought aboard. "It's hard to believe until you're on it; the picture doesn't do it justice." In addition to DVCA's 20 technicians, more than 250 specialists from various firms were working on many other aspects of the ship's infrastructure during an extensive overhaul. "It's not just anybody that can board this ship," said Vinick. "Every day we had a 2 o'clock status meeting and then a 3 o'clock inspection; there was a lot of thorough planning that went into the work. They spent well over an hour and a half to two hours each day to approve clearance for the next day to complete the 5.68 miles of duct and vent cleaning." In all, the process took about five weeks, and Vinick looks over the past years and the Comfort job as clear evidence that every night of lost sleep 20 years ago was well worth it. Recent investments in his software will put the company in another league, business-wise, potentially tripling DVCA's revenues, said Vinick, allowing managers and technicians to do bid calculations on the road, in addition to being able to work in real time with their clients. But one thing that will also grow is his ability to give back, and the company is now in a comfortable position to do that, through the Jimmy Fund and donations to local charitable organizations. "The goal is to keep growing and to give back, and it's clear that our team can handle any job on any scale from U.S. military facilities to residential and commercial services," said Vinick. "We named the company Duct & Vent Cleaning of America, not of Western Massachusetts." And it has come a long way from that income-tax report that Vinick keeps on his desk.